Have you ever wanted to be "that person"? The one who is on the ball with kind gestures, birthday presents, or thank you cards? Embracing random acts of kindness to show those around you that you appreciate them is something much easier said than done. Life is hectic. We're busy people. We don't all have time to run out on the spot when the urge strikes us to do something nice. And let's face it, remembering to pick up a little something for a friend when out doing other errands never seems to work out. But if you're really determined to make it happen, there are ways to work it in. I started a "Tools of the Trade" series last year, and quickly realized that any successes I have in living a creative life are based around systems and not what's in my toolbox. I have a huge family, and have had to make those relationships stay afloat by being creative and organized. So, seeing as March is all about relationships, I am starting a new series called Kindness by Design where I'll be sharing tips for how to make random acts of kindness an easier thing to accomplish. 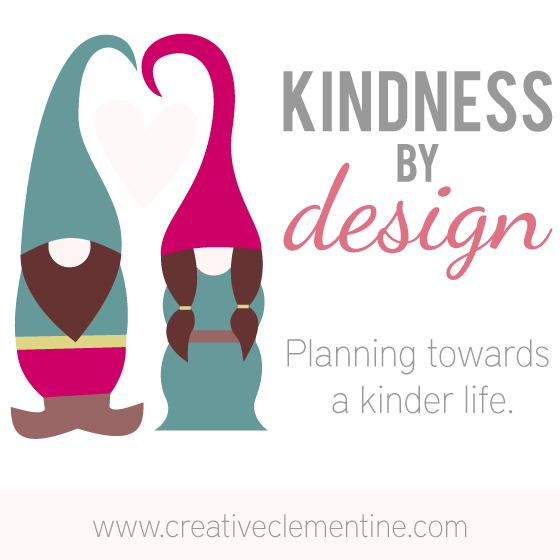 The objective of the Kindness by Design series is to share some easy ways to build thoughtfulness into your day to day life. And, as promised, I used one of my old #30daysketchchallenge drawings in the graphics. Above is the transformation from doodle to digital. 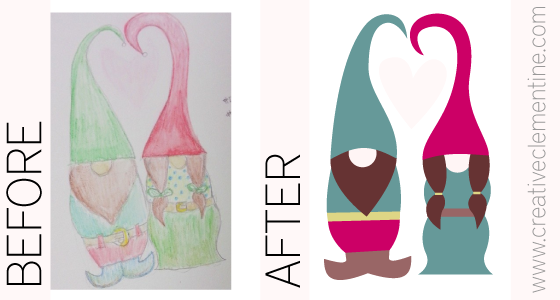 It's actually pretty fun seeing one of my quick gnome doodles turn into something more usable! I cleaned up the details a smidge but it's pretty close to the original. It maintained its essence of gnomey goodness and is just cute enough to be used for this new fun series. The new Kindness by Design series starts tomorrow! Join me over the next few weeks as I share some of the tricks I use to keep on top of my relationships and be prepared for those moments when a kind gesture is most needed. I'm looking forward to your new series!! I would love to be more attentive, and do nice things for others rather then be so self absorbed. Thank you for sharing with us at Merry Monday! Sounds like a great series! I love your gnomes graphic. Thanks for sharing at What'd You Do This Weekend? I hope you will join us again this Monday! Sounds like a great series! I'll definitely be popping by to read it! And thank you for being so kind and sharing this great printable! I'm excited about this series. I'm really impressed how you took a sketch to digital. I am always interested in how people do that! Pinning! Thanks for sharing at Totally Terrific Tuesday last week!